Washington (9-2, 6-2 Pac-12, No. 18 CFP) pulled even at 30-all on Myles Gaskin’s 2-yard TD run with 58 seconds remaining. 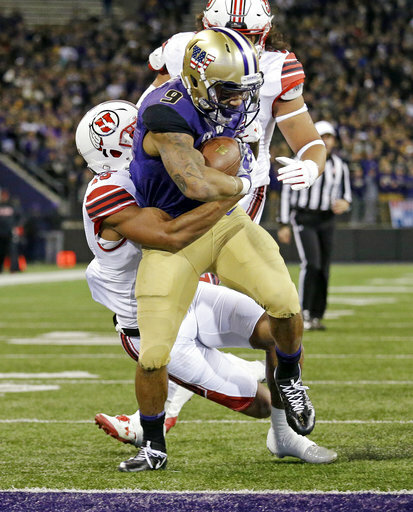 After Utah punted, Washington got the ball back with 29 seconds at its own 28. UW tried a running play and it looked like the game was headed for overtime. But Utah coach Kyle Whittingham called a timeout. 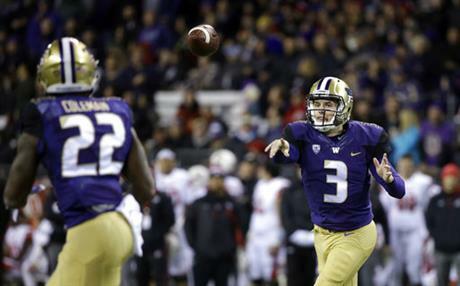 Given new life, and without any timeouts of their own, the Huskies decided to go for the win. Washington QB Jake Browning hit Dante Pettis for 18 yards to near midfield, and then the big play was a 31-yard strike to Andre Baccellia to the Utah 22 with 8 seconds left. Washington took one shot at the end zone that was incomplete before Vizcaino made his second field goal of the game. Vizcaino had missed from 30 yards and missed an extra point. Utah’s Tyler Huntley threw for 293 yards and two touchdowns, ran for another 48 yards and a touchdown, and his big second half had the Utes (5-6, 2-6) in position for an upset and bowl eligibility. But Browning was even better in the closing minutes. Washington took possession with 2:03 left at its own 39. Browning misfired on his first three passes, but on fourth down he found Baccellia for 14 yards. Browning then hit his next four throws, including a 28-yard strike to Will Dissly to the Utah 2. Gaskin scored on the next play, and the extra point tied it. After Utah went three-and-out, Utes coach Kyle Whittingham called timeout with 23 seconds left after Gaskin was stopped on a 2-yard run. Browning hit the next two throws, and Utah was left walking off with a shocking loss. The night appeared to be a complete thud for Washington. The Huskies lost out on a chance to repeat as Pac-12 North champions earlier Saturday night when Stanford held off California, knocking them out of the division race. The best Washington can do now is complete a second straight 10-win season and more importantly, end rival Washington State’s hopes for the Pac-12 North title. If the Cougars beat the Huskies next Saturday, Washington State plays in the Pac-12 title game. If the Huskies win, then it’s Stanford. Utah was the one playing as though a division title was at stake. Whittingham pulled out all the tricks. He called an onside kick in the first half that was successful, and even more daringly, called a fake punt facing fourth-and-17 from his own 27 early in the fourth quarter. Punter Mitch Wishnowsky kept the ball and barely got the first down. The fake punt proved to be a critical decision. Huntley hit Jake Jackson for 39 yards later in the drive to the Washington 5, and Huntley scored on the next play to give the Utes a 30-23 lead with 10:52 remaining. Utah: Despite missing a pair of starters on defense due to injury, Utah managed to hold Washington’s run game in check. The Huskies finished with 123 yards rushing, but while Gaskin had a big night receiving, he managed just 52 yards rushing. … Utah became the first team to score 30 points on Washington at home since the Utes did it two years ago in a 34-23 win. Washington: Despite only being juniors, Browning and Gaskin took over the top spots in Washington’s record book. Gaskin’s 9-yard TD run in the first quarter was the 38th of his career, moving him one ahead of Bishop Sankey for most in school history. Browning also took the top spot for career passing TDs when Lavon Coleman took his dump off pass and found his way into the end zone in the second quarter. It was Browning’s 76th career TD, passing Keith Price on the career list. Utah: The Utes close out the regular season hosting Colorado next Saturday. Washington: The Huskies face rival Washington State in the Apple Cup next Saturday.